If you want a quick induction into the Christmas cheer at this time of the year, here are some destinations in India which will instantly draw you into the holiday spirit. A wintery chill, enlivened with carols and bright splashes of decorations, is just what you need to end the year in the right spirit. The effervescence of the festivities is infectious as you enter the city during the Christmas week. Brightly decorated cafes flank the cobble-stoned streets and the city is abuzz with parties. Vasco Da Gama’s discovery is soaked in gaiety; even the otherwise sombre Basilica and the Vasco Church sport festive decorations. ‘All you can eat’ dinners and elaborate buffets are booked ahead of time as travellers ensure that they are not relegated to a bland Christmas feast. Goa promises an enchanting holiday through the year, but it’s during Christmas that it truly comes alive with un-touristy local flavour. The best way to taste that is in the Fontainhas area of Panjim. Despite the contrast between the erstwhile Latin Quarter and the Hindu homes, the area reverberates with celebrations during this time of the year. An ideal Christmas day would include winding your way through the Fontainhas and Sao Tome heritage areas with bright coloured balconies hanging onto the narrow street below, before grabbing a beer and some cheer at one of the old atmospheric pubs, and ending the evening at the white Church of Immaculate Conception. A stunning view is not the only lure that draws throngs to Mumbai’s Mount Mary’s Basilica. Overlooking the sea, Bandra’s most famous landmark is bedecked in lights long before Christmas. The century old establishment is famous for its midnight mass, which starts at 11.30pm on 24th Dec. 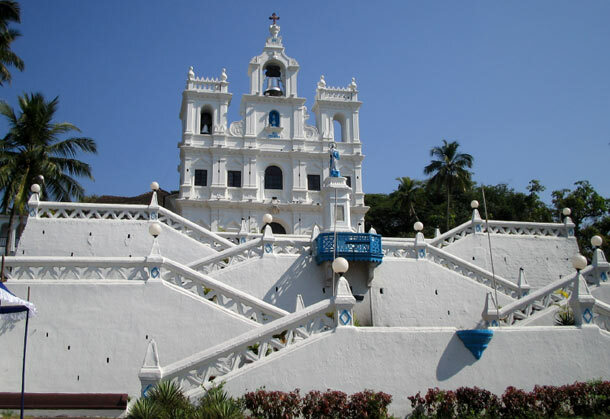 The cosmopolitan composition of the community around this area ushers in an irrepressible festive atmosphere with people exchanging gifts, singing carols and attending the mass in large numbers – perfect to get initiated into a Mumbai style Christmas. Traces of Peter Colaco’s authentic colonial Bangalore can still be found in the churches of the city. And what better way to experience this history than against the backdrop of holiday festivities during Christmas? Chalk out a Church trail for the Christmas weekend around the arterial M.G Road area and soak in the celebrations. Start with the Holy Trinity Church, moving along to the historic East Parade Church, then to St. Patrick’s on Brigade Road and St. Mark’s Cathedral with a stopover at St. Andrews on Cubbon Road. End the trail at the St. Mary’s Basilica at Shivaji Nagar, which stands testament to the city’s cosmopolitan vibe since 1803. An unlikely addition to the list, travellers with an appetite for the offbeat will enjoy the subtler celebrations in the faraway hills of Nagaland. Villages like Aizuto, Mopungchuket and even the more popular Kohima exhibit star-studded porches and the smallest hillside churches ring with carols. The contrast between the tribal heritage and the joy of Christmas is heart-warming enough to refresh a traveller’s mind with plans of new travels in the next year.